I love being full of surprises and this is just one of many. hehe. No series this summer could have any more meaning, than featuring some swimmer boys. I knew immediately, something special had to happen. Free! season three was something thought, wouldn’t happen but late last year – It became a thing. Now that’s it’s here, it’s still surreal feeling that it’s not sunk in for me yet. A special something to mark the return of this Kyo Ani beauty, every week I’ll be doing episodic reviews. But, in no way am I, doing this alone. Fellow OWLS member and blogger friend Hazel, is crazy for the Free!. She might be worse than me.., haha. Hazel will be joining alongside me each week to cover, the addictive nature that is Free! Hi Lita! Thanks for having me. 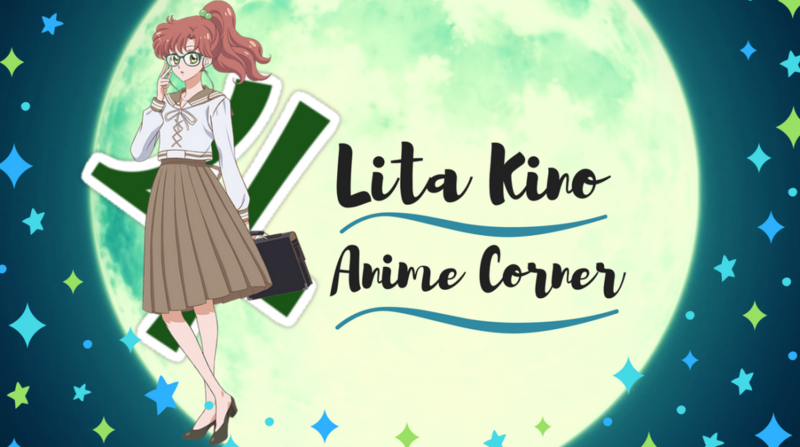 First off, I want to thank you for asking me to take part in the fan-girling *cough* discussion of an anime that is very near and dear to my heart! Second, we’ve said this before, but I am so so excited for the newest season! And looking forward to our weekly Free! Sessions! ❤ and haha, yes I might have to agree that I could possibly be worse and too invested in this series! Lita: Hazel it is clear enough, how much you love Free!. You spammed your twitter to death with how excited to watch the premiere episode. That could have resulted in some unfollows, doesn’t that bother you? But it’s okay I love you and you can let your loving free heart here. No judging here. Zel: Haha, it could have resulted in some unfollows, but I don’t get too hung up on those kinds of details lol. So, meh doesn’t bother me much. Lol. Lita: Now down to business, premiere first episode. It was positively alluring and electric would be my first words. There was no way Kyoto Animation could leave off, how Free! was from season two. Haru realising the importance in his dream and explore his options. Now the boys are in the big league of college. The name ‘Dive Into The Future’ for season three sounds so perfect. Know what else was perfect? The first few seconds of the episode, similar to the introductions of season one and two. This time round Haru in the water, reflecting from how he used to be about swimming previously. That few seconds of reflection thought was really sweet. But THAT POOL WATER. It was glistening like you could jump in any second. Ever since getting into Free!, all ever now when thinking of it, I just want to go swimming. Animation throughout the episode was truly flawless and have no doubt will be for the whole season. Hazel, Did that pool water, make you want to take a dip ahaha? Zel: *ahem* To quote Haru in season 1 “The water is alive”. Yes, I wanted to dive in!! The water is animated sooo well. I think that the animation of the water is pretty important. I mean, we know that a lot of the series actually doesn’t revolve too much around the actual sport, so I think that for them to put an emphasis on the animation of water when they are in it, is a big deal. Lita: It was funny Makoto comes in, and Haru pulls him into the pool. That was unexpected as the old Haru would have never done that. It shows Haru is being less uptight than he used to be. I agree Lita! The opening scene is iconic to every single opener of the seasons as well as the high speed movie. Haru is often exasperated with Mako’s antics so for him to pull him for once was a nice way to break-in the change Haru and the rest of the boys are experiencing. Haru throughout the episode is a lot more comfortable with where he is and actually wayyy less stoic and uptight as he has been in previous seasons. I mean, HE’S SMILING most of the episode!. He’s smiled way more here than he’s smiled in previous seasons. Also, Haru makes it a point to tell Asahi that he doesn’t just only swim Free anymore. Our boy has grown up so much *tears up*. Continuing on with another iconic scene in this opener was watching our duo Makoto and Haru approach the train station with Makoto running across the tracks as the barrier comes down. We all know that Haru has experienced this similar scene with Rin as he ran from Haru having lost that race that caused the rift between everyone in season one. When the barrier comes down the scene, cuts to Haru and Makoto on their respective trains that depart in opposite directions. The symbolism of this scene speaks volumes! Haru and Makoto are now heading down different paths that still relate to their love for swimming; it’s literal but gosh, did I love that detail. What did you think of it Lita? Lita: I’m actually in disagreement scene of Makoto and Haru at the railway tracks. Being a similar representation to Rin drifting away from Haru and others. As Makoto waves bye, Haru is looking back, is not ringing sadness. Unlike with Rin from previous seasons. I feel it symbolises, new beginning for both, but they are closer than ever. Throughout the episode, when the pair are together. It’s still there, Haru and Makoto closeness. Sorry hazel, haha, if my opinion surprises you. Hazel: No, no. We’re in agreement my dear! I didn’t mean to imply that the two were drifting apart and that Haru was sad. I was more focused on the fact that they’re just separating in terms of their goals. If anything those two have a strong bond that wouldn’t snap just because they’re not physically together at college. Overall, I’d like to point out that all our boys are full of smiles this season, even the stone faced Sousuke is breaking out into smile every so often. For the most part, I think a lot of everyone’s angst and issues have been since resolved since season 2, but of course Free! wouldn’t be the series we know and love without some problematic character that’s got some angst, this season it’s Ikuya. BUT, before we get into Ikuya and that whole thing, I’d like to touch on a few other character’s, and feel free to chime in on any of these boys! Going back to Sousuke though, how did you feel about his character in Season 2 Lita? I’m personally hoping his story gets more fleshed out here in Dive to the Future, he’s one heck of an underdog character that deserves a great future just like everyone else. Lita: You are most definitely the informative one in Free! Hazel, that’s a compliment. I can say I’m in agreement there is a, pleasing atmosphere. For Free! third season. There was much to take in this first episode, was great every character got spotlight. Course, I was excited to Rin, best boy for me throwing that out there. Before I dive into your question Hazel, cannot believe you girl, never mentioning – Rin and Haru’s swim sequence. The electric music, side by side screen layout, appearing as if they are racing. That was an excellent scene to represent, Free!’s stand-out music. Did you remember that scene Hazel? This scene had such adrenaline. Hazel: Of course I know that scene! It was beautiful! But, I know it stuck out to you when we had chatted about it, so I wanted you to talk about in depth because I know I get too deep into things. LOL. Lita: Asking your question regarding Sousuke, At first Sousuke wasn’t my favourite. But, delving into Sousuke’s reasoning of hostility towards the Iwatobi boys. Made me like the softy in the end, Sousuke is more than a likeable character. The introduction of Ashai, Haru’s middle school friend, was new to me. Ashai is quite the hot head, but he is hilarious – be nice getting to know him. Hazel: One character that really stood out to me in season 1 was Mikoshiba Seijuro. I really liked the captain of Samezuka. Granted he’s just an older momo, he’s a funny addition to the cast and definitely the big older bro type; so for him to appear on screen as Haru’s teammate literally had me screaming at my television. I knew he’d make an appearance but for them to be in the same team makes him more than just some side character (hopefully). Hazel: Okay, let’s head back to Ikuya, what are your thoughts on him? Lita: Yes the next Rin. I’m sorry but it is plain obvious with Ikuya’s character. What transpired between Rin and Haru, we’re going through this again. Hey, I have no issue with that. From not seeing the Free! films like ‘Starting Days’ you’ll be more versed Hazel, in Ikuya’s character – than I. It was hard to get a feel of Ikuya’s character at first but no question in my mind like Rin was. Ikuya viewing Haru as his rival and wishing to beat him. From the brief flashback of Haru and the others younger griefing their swimming lose, brief moment Ikuya staring over at Haru. Indicated a look of desperation, that gave off repressed feelings, Ikyua had hidden away. Hoping for episode two, will get too see what Ikuya’s true feelings are. Hazel: Also agree, he’s the Rin of this season, but I think I’ll save what I have to say about this boy in the next episode! 😀 I just want to know, what happened for Ikuya to become the way he is. So Lita, we both love music, and we all know how I spectacularly failed at using the discord bot for it *cough* but on that note..I’d like to know, which did you prefer? The OP or the ED? Lita: Hazel doesn’t know how to use discord, just for reference aha. This is not a hard one for me the opening was electric, was my favourite. OLDCODEX band behind Free! OP and ED deliver again with another rockful opening ‘Heading To Over’. Free! music I’ve spoken before, the variation of musical pieces on the OSTs. 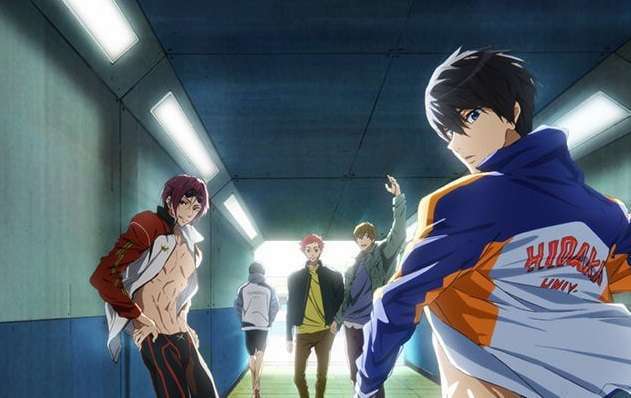 All of Free!’s opening and ending themes are addictive, that is what so great about them. I don’t think I’ve ever fangirled so hard over an ED. I think KyoAni was just trying to give me a heart attack. All of them doing choreography in suits. Are you freaking kidding me? And then Haru has the nerve to wink? AHH! The cuteness was too much to bear in that last minute! Hazel: I laughed so hard at the “streetgang” thing with the high speed cast trying to intimidate the hell out of the Iwatobi/Rin group. Like, what? Haha! What was your favourite part of the ED Lita! Lita: Seeing opposition teams do this street face off, few minutes into the ending. Very smooth, swift ending filled with class – is how I would describe it. Sousuke in a suit was a surprising sight to see, haha. Got me like o lala. It’s clear enough to see Hazel wrote way more than me for this first episode review. That could end up being the case from now on. haha. The return of Free! was a smashing starting, seeing Haru, Makoto again taking a step into the university scene. It’s a refreshing setting, seeing new faces. Hazel and I are ready to dive each week, into the funness that is Free!. We know this is late our first impression but we’ll be looking to have episode two out this week, that will over on Hazel’s blog. Episode three will be out early next week on my blog!! As we alternate episode posts on each others blogs. I’m surprised in seeing anyone hardly review this series, Lucky me and Hazel then!!. We understand Free is not for everyone. Before concluding this post, when this comes out It will be Miss Hazel’s birthday. HAPPY BIRTHDAY GIRL!!! Have a smashing day. I’ll have a surprise for you hehe. Tell us are you excited of Free!’s return as me and Hazel are!!! or just not really?? See you guys next review !! Next It’s A Zany Zainou Friday Feature!! Great start for this surprise collaboration… can’t believe this Zel haven’t said anything to me… 😂 . Really looking forward your weekly collaboration girls! !